I watched. I waited. I held my breath. I hoped. I prayed. 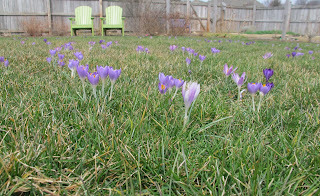 I planned for crocuses to be blooming in the lawn on Easter. I planned for sunshine and warm-enough-to-be-outside temperatures. 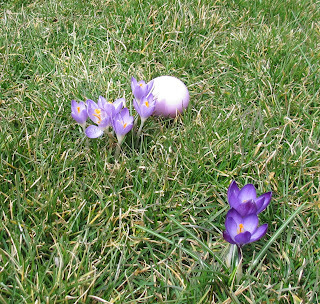 And lo and behold, there were crocuses blooming in the lawn for Easter and it was sunny and around 60F when we started the big egg hunt. I love it when a plan for the garden works out just like I planned it would. 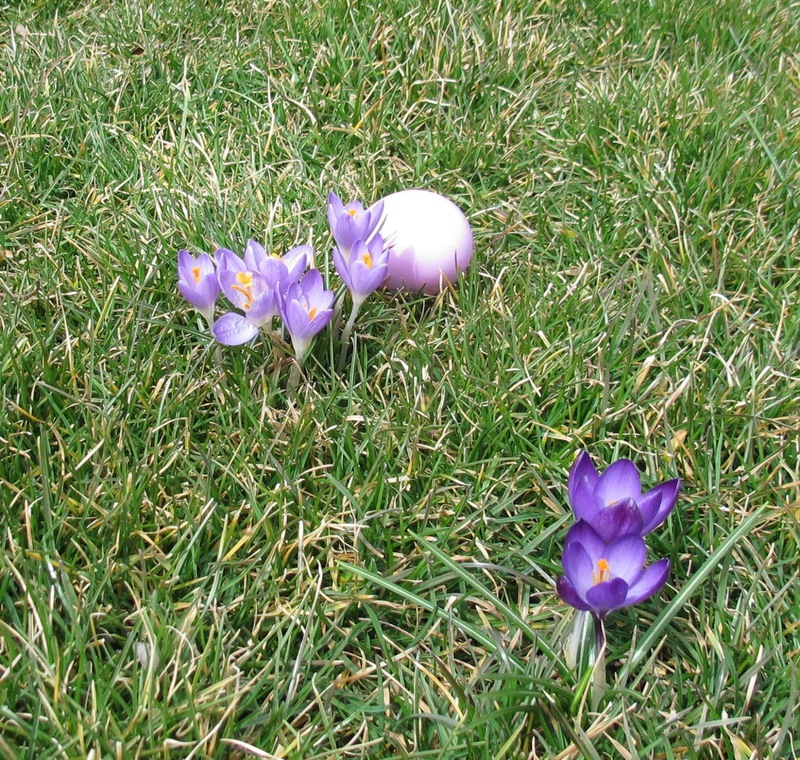 The crocuses even helped hide one of the eggs. No kidding, this was one of the last eggs found, and then it was only found because I stood next to it and motioned to one of the hunters so she would see it. There were other flowers blooming on this very early Easter including Lenten roses (Helleborus sp. 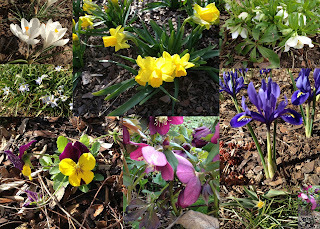 ), star flowers (Ipheion uniflorum), irises (Iris reticulata) tiny daffodils, white crocuses, violas, and the first tiny tulip (Tulipa biflora). Now it's time to plan for next Easter, which will take place on April 20, 2014, three weeks later than this Easter. 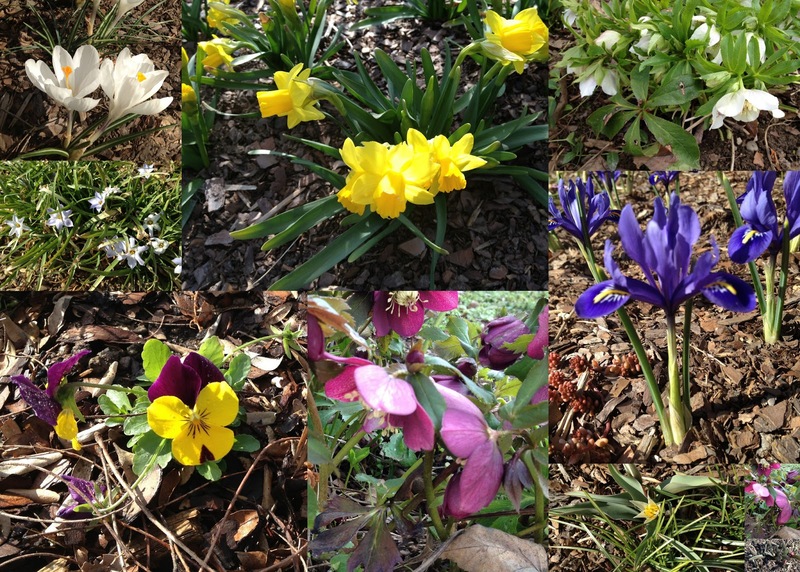 In garden-time, that means a whole new set of blooms for the big egg hunt. I'm going to go through my gardening journals for the last few years, both online and on paper, and figure out what should be blooming in my garden around mid-April. 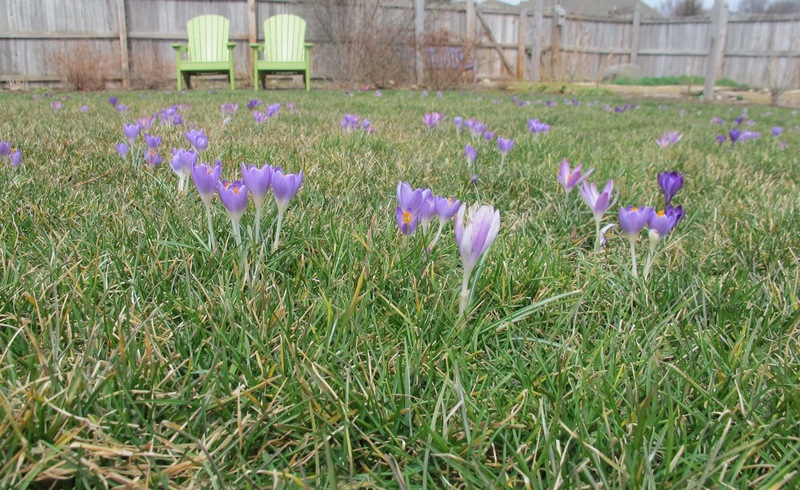 There won't be crocuses in the lawn by then - they'll be all bloomed out - but there should be more trees and shrubs in bloom, along with tulips and daffodils. I'm also going to study the bulb catalogs and websites to pick out more bulbs that should bloom mid to late April and order them to plant in the fall. And of course, I'm going to watch and see what is blooming in my garden in three weeks. I love it when a plan for the garden works out just like I planned, and hope that next Easter turns out to be as nice as, if not better, than this Easter was in the garden. That is a great plan, Carol. Such a late Easter next year means it will be a whole other season of blooms. How fun! Also take pictures of what is blooming in three weeks. That helps you know not only what is blooming, but where, so you can fill in the gaps. I only had a few snowdrops and winter aconites blooming for this Easter. Next Easter is more promising--something should be blooming then! Just beautiful and just in time for Easter. I love the picture of the Easter egg behink the Crocus! Sounds like good fun was had by all! Good luck with all your planning for next Easter.